Weight loss is a hard journey, which is only exacerbated when you plateau. According to the Mayo Clinic, this is normal and is described as a sudden lurch in your progress despite your continued healthy eating and exercise habits. A plateau occurs when your metabolism slows as you lose weight. Your body burns more calories when it's larger, so slimming down slows your calorie burn. While it's definitely frustrating, there are tips you can follow to get things going again. The Mayo Clinic suggests looking back over your progress and making sure you haven't let the rules slide as you begin to shed pounds. Perhaps you've slimmed down and find yourself sneaking a cookie here and there or you shorten your workouts a bit. Try keeping a food diary to make sure you aren't hindering your own progress. Record your food intake, taking care to write down exactly how much you ate and when you consumed it. That way, you'll be able to see patterns that could be causing your plateau. Maybe a pasta dinner causes you to overeat or an afternoon meeting drives you to the vending machine. Whatever it is, your records can help you figure it out so you make the appropriate changes. Write down your exercise routine. You might notice yourself cutting a few minutes off your cardio or stopping your weight training short a few reps. Whether you're doing this on purpose or not, a written record holds you accountable so you can blast through that plateau and get back on track. Sometimes all it takes is a small adjustment to your daily caloric intake to jumpstart your weight loss. What may surprise you is that sometimes this means it's time for an increase instead of a decrease in calories. As you get smaller, your body needs fewer calories to support exercise and day-to-day activities. Continuing to eat the same number you did at the outset of your weight loss program might be the reason you've plateaued. The Mayo Clinic suggests cutting your calorie intake by about 200 per day as long as you are eating at least 1,200 calories per day. Fewer than that and you won't have the energy you need to sustain yourself during the day. You may wonder how taking in more calories could possibly get you through a plateau. Drastically cutting calories at the outset of your weight loss journey may help you drop weight right away, but then your body goes into preservation mode and starts hanging on to fat as a means for survival, says Karen Handy, M.P.H. of the Palo Alto Medical Foundation. 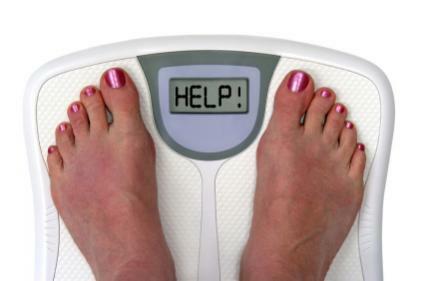 By adding a small number of quality calories to your daily intake, you might see the scale start moving down again. Fiber helps control your hunger because it digests slowly, which helps keep you from feeling ravenous between meals. Increasing fiber intake can help you blast through your plateau and stop the snack nibbling. In fact, research published in the journal Appetite proves that fiber can help you eat less. The trick is to choose low-calorie sources of fiber to help you keep your intake under control while also reaping the benefits. Incorporate high fiber foods into your meal plan, being sure to balance their calorie content with the other foods you choose. Sometimes thirst is misinterpreted as hunger, and having a tall glass helps you realize you're not actually that hungry. Doing this several times per day can help you bust out of your plateau and get your weight loss jump started again. Additionally, water can help you flush out excess sodium, note the experts at Shape magazine, which can help you shed pounds. Water can also help tame your appetite at meals. Drink a glass before you sit down to eat and you could take in up to 90 fewer calories per meal, according to a study conducted by the American Chemical Society and reported in Nutrition Review. By adding just 15 to 30 minutes to your workouts, you can power through the plateau and get back on track, says the Mayo Clinic. Just a few extra minutes can help you burn enough additional calories to get the scale moving back down. If adding time to your exercise sessions is hard to manage try these other tactics from the Mayo Clinic that can be just as effective. Rev up the intensity of your workouts. Try interval training to blast more calories in the same amount of time. Or simply push yourself a bit harder while you exercise to ramp up your calorie burn. Add strength-training to your routine. This builds lean muscle mass and lean muscle mass burns more calories at rest and in motion. Try lifting weights, doing resistance exercises or using your body weight to do push-ups, squats and triceps dips. Try different forms of exercise. If you always go for a run, try swimming or biking. The new challenge is often just what your body needs to get back on track. Yes, increasing your exercise time each day can really up your calorie burn, which can help you get through a plateau. However, the Mayo Clinic suggests moving more during your daily routine as well. This can burn additional calories and get you back on track without much effort. Try the following techniques and you'll start seeing progress again soon. Park at the end of the lot and walk further to get to where you're going. Do some vigorous spring cleaning in your house. Walk around while you talk on the phone instead of sitting down. Do some squats, calf raises and push-ups while you wait for dinner to cook. A plateau is never easy to deal with, but you aren't doomed to being stuck either. Start with some small changes, much like you did when you decided to lose weight in the first place. Start with some tweaks to your eating habits, then work on your exercise routine. Those tiny triumphs you'll experience can get you through the plateau and make you feel successful again. If you can't bust through, talk to your doctor to evaluate your goals. In no time, you'll be looking and feeling great.